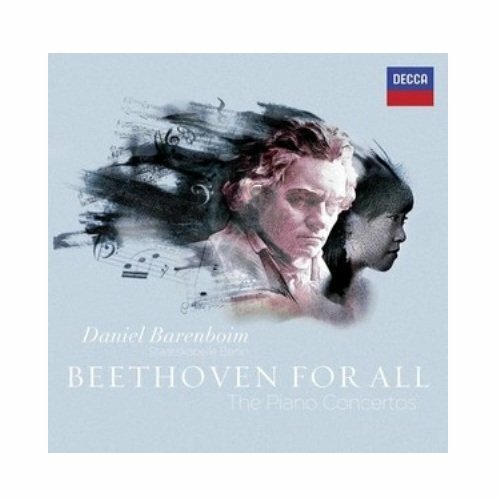 Beginning this summer and extending through the fall to the holidays, Decca presents Beethoven for All, a major series of recordings of Ludwig van Beethoven s complete symphonies, piano concertos and piano sonatas with conductor-pianist Daniel Barenboim one of the greatest Beethoven interpreters of our time. In August, the Beethoven for All series continues with a five-CD set of Beethoven s Piano Concertos Nos. 1-5 with Barenboim leading the Staatskapelle Berlin from the keyboard. The Financial Times gave high praise to Barenboim s playing of Beethoven with his Berlin players: The performance bore the hallmark of greatness, if only because of Barenboim s willingness to take risks. In his rapt opening bars, he opened the audience s ears; then he let the music fly, not just in his own quasi-improvisatory flourishes at the keyboard but also in the way he and his orchestra explored the music s expressive contrasts. By generating a lot of flexibility within a given tempo, he created a sense of surprise. However well-worn the music, it never sounded predictable. The first installment in the series comes June 19 a five-CD set of Beethoven s Symphonies Nos. 1-9 with Barenboim leading the West-Eastern Divan Orchestra, an ensemble acclaimed the world over for imbuing fresh, irresistible life into the classics. Of Barenboim s concerts with this orchestra of multi-national talent, The New York Times said that the conductor s penchant for spontaneous music-making clearly excites these young players, resulting in performances that are impassioned and risky. A second special release on June 19 will be a two-for-one CD set of highlights from Decca s complete Barenboim-Beethoven series Beethoven for All: Music of Power, Passion and Beauty. This set features select movements from the new recordings of the symphonies, piano concertos and piano sonatas. Speaking to Barenboim s unique gravitas as a dual performer in this music, the U.K. s Observer said: There is no artist alive capable of performing both roles as authoritatively, originally and effectively as pianist-conductor Daniel Barenboim. Many people feel or think, without really knowing, that music is somehow elitist that it is for people who can afford the money and the time; it s something that has only to do with leisure. But music is not elitist. On the contrary. Music is not only not elitist, music is universal. Even though all the great composers of the past are European, music doesn t speak only to Europeans. (I was born in Argentina; if I were limited to my music, I could only play tango!) This music, although it was written by Beethoven in Bonn or in Vienna, speaks to people in Ramallah, in Australia, and everywhere else. This is why it is not elitist. Music is for all, for everybody everybody who opens their mind and heart to it. It needs that curiosity, and it needs attentive listening, but then it s for all. And if you ask people who do not think of themselves as musically inclined: Who do you know They all say, Beethoven. So if we want music for all, then it must be Beethoven.